Montessori & Toddlers: No to "No!" The toddler years can be rough. Our little ones scamper around enjoying the new independence of walking and running as they climb up on everything to explore the world around themselves. Our job is to nurture this independence and excitement for learning while providing safety. It is relatively easy to do this at home, but what about the outside environment? Cars, public spaces, and other challenges await. First, start at home. Once your home environment is safe for toddler exploration with the appropriate facilities in child size (bathroom, kitchen, bedroom, and so forth), your toddler can develop good habits to take outside the home. One key to safety that is easy to overlook is what you say to your child. Make sure you do not give commands such as "No!" as part of your usual interaction with your child. You need to save this command and this tone of voice (we all know that tone of voice, right?!) for an emergency. Your "no!" should stop your child in his or her tracks. Just before he or she darts in front of a car, pulls a pot of boiling water down from the stove, or sticks a knife into an electrical socket. Practice at home. Now let's try outside. 1. Let your child walk and explore independently, but when you stop at a crosswalk, you and your child hold hands to cross the street. If your child does not want to hold hands, the street does not get crossed. 2. Say, "We look left, right, and left. And we cross the street." Keep it short and simple. And demonstrate by saying the words as you do the actions. No whining or talking as you two cross the street. 3. Develop a routine for getting into the car and ready to go. Create a checklist and say it aloud with your child. For example, "Sit in the carseat, buckle up, Mommy puts on her seatbelt, and off we go." Sitting in the carseat and buckling up are part of the routine and your child learns that the car doesn't start without these two things. In between times, try to allow your child the freedom to explore and look around. For example, if he or she is crouching on the ground looking at something, don't let yourself admonish him or her for crouching on the ground. Either join your child or let him or her enjoy the exploration unhindered. One easy thing to do is to develop the habit of not interrupting your child. It is easy to wonder what your child is doing and call him or her to see what's up. Don't do this. If you must, quietly walk to the room your child is in and take a peek. If all is well, leave without saying anything if you have been unobserved (and especially if your child is absorbed in something). These simple steps help develop concentration and discipline. More shortly! Summer is a great season for infants and toddlers. They can roam around unbundled as they creep, crawl, and toddler to explore the out-of-doors. 1. Grow plants for your child to water, weed, and pick. It is important that they be pesticide free and that you not be upset if the plants bear a bit of bad treatment if your child bites the leaves or whatnot. We suggest growing only edible plants so that your child does not risk poisoning that can happen with occasional decorative plants. 2. Take advantage of growing the fruits and vegetables by showing your child how to pick them and put them into a basket. 3. See our Practical Life post on our general Montessori blog for ideas on incorporating the plants and produce into a variety of exercises. 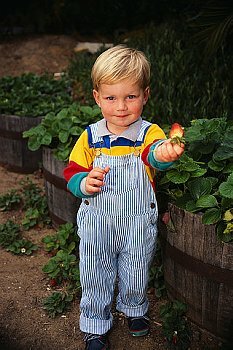 Infants can handle the produce, and you can show them how to peel or eat the fruit/vegetable. You can show your infant how you take the peeled fruit and prepare it, if it is too big to be bitten from the whole.